Sampler Hill by With Thy Needle & Thread - 40 ct. Pecan Butter using Classic Colorworks, Gentle Arts and Weeks Dye Works (1 over 2). Jenny Bean's Halloween Sampler by Shakespeare's Peddler - 40 ct. Vintage Pearled Barley using special edition GAST (1 over 2). 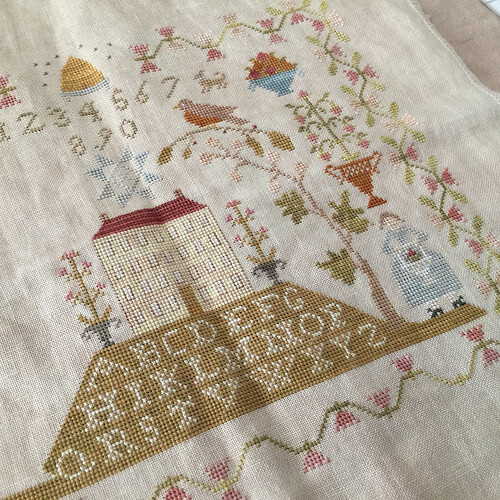 The Rampant Cats Sampler by Barbara Ana Designs - 40 ct. Vintage Fawn using DMC (1 over 2). Love Never Fails by Barbara Ana Designs - 40 ct. Vintage Meadow Rue using DMC (1 over 2). Test Knit for YarnPoetry using Madelinetosh Tosh Merino Light in Vermillion. I love the Rampant Cats sampler! What a cute Halloween Adam and Eve. Love, love the Hands Across the Seas samplers. I have purchased two of their patterns; I have not started either of them yet, but hope to soon. So glad that you posted another video; I always look forward to seeing what you have been up to. Happy stitching.